Which market segment has the highest share of employees using used/refurbished notebooks? Do older notebooks have a life, and which market segment has the highest concentration? Smaller companies – those with fewer than 100 employees – have the highest share of Used/Refurbished Notebook PCs in use – 17% or one in six. In businesses with 100 to 999 employees, the rate is lowest at 7%, and slightly higher for employees in organizations of 1,000 or more employees: 11%. These results are based on the most recent wave of Technology User Profile, the TUP 2014 edition. More can be found in the PCs chapter. The large-scale survey is in its 32nd continuous year, documenting and detailing the full scope of technology adoption and use. For this MetaFAQs analysis, MetaFacts is sharing a portion of the answers to selected survey questions: specifically the PCs in active use, and whether the PC was acquired new or used/refurbished. The full TUP service includes further related details on the types and brands of PCs, segments and profiles of those who use PCs more than Smartphones and vice versa, detailed activities within each category and mapped to each PC, and much more. The TUP survey gathers comprehensive details about the active usage of many consumer electronics products, including Printers, e=Book Readers, Smartphones, Basic cell phones, and many other connected devices. In addition to tracking PCs, Technology User Profile details the many devices which online adults use to regularly connect to the Internet. The survey-based research details what people do with their devices, where they spend their technology dollars, and how often they update (or don’t update) their technology products. Technology companies who want to know more about technology adoption, wireless technology, or about their current or future customers can contact MetaFacts to learn how to subscribe to the rich resources of Technology User Profile. MetaFAQs – Frequently Asked Questions with answers supported by the facts: the MetaFacts. Smartphones are now the dominant device, although only slightly. In active use by 65% of Connected Adults, Tower Desktop PCs have effectively equal penetration at 64%. Notebook PCs aren’t far behind at 53%. Interestingly, Smartphones are only the primary device for one type of activity – Communication. Even though Communication activities of one kind or another are being use by effectively all (99%) Connected Adults, it’s the only category of activities for which the Smartphone is the preferred device. For nearly every other type of activity, Tower Desktop PCs are the preferred device. Among adults that use any Connected Device for Communication activities, 31% prefer to use a Smartphone, 12% prefer to use a Tower Desktop PC, and 6% prefer to use a Notebook PC. Communication activities includes voice calls, video calls, emails, chats and other forms. These results are based on the most recent wave of Technology User Profile, the TUP 2014 edition. More can be found in the Activities chapter. The large-scale survey is in its 32nd continuous year, documenting and detailing the full scope of technology adoption and use. For this MetaFAQs analysis, MetaFacts is sharing a portion of the answers to selected survey questions: specifically the Connected Devices in active use, and the types of activities each one is used for. The full TUP service includes further related details on the types and brands of devices, profiles of those who use Smartphones more than PCs and vice versa, detailed activities within each category and mapped to each device, and much more. The TUP survey gathers comprehensive details about the active usage of many consumer electronics products, including Printers, PC, Smartphones, Basic cell phones, and many other connected devices. In addition to tracking activities, Technology User Profile details the many devices which online adults use to regularly connect to the Internet. The survey-based research details what people do with their devices, where they spend their technology dollars, and how often they update (or don’t update) their technology products. Extensive information about PC, Smartphone, Tablet, and cloud printing is available in TUP – Technology User Profile. Certain segments of consumers are increasingly finding ways to share some images and documents without printing, while other segments continue to print as usual. Below are a few examples of questions addressed in TUP related to printers and printing activities. The full TUP service enables drilling down beyond the answers to these questions to identify which other technologies, services and behaviors are disruptive and to profile which market segments are and aren’t adopting. TUP is much more than a one-dimensional market view or opinion piece. How many printers do people actively use? How do Home Printer users differ from those primarily using Work or Shared printers? Are most workplace printers in small or large businesses? Which home printer brands have attracted tech Early Adopters? Whose Home Printer customers have the most printers? Whose Home Printer customers are more likely to use Monochrome than Color? Whose Home Printer customers are most likely to use WiFi to connect their printer? Whose Home Printer customers have the newest Printers? How does the market share vary between Home and Work printers? How does the market share vary between Home and Work printers by printer type? How much does the HP printer footprint overlap Canon, Epson, and Brother? Where are monochrome printers used the most, and by what margin? Which printers are newest – Home, Workplace, or Public/shared? Do users print more pages on Home, Workplace, or Shared/Public printers? To what extent is refilled ink being used for Home printers? Which segments have the highest share using refilled ink/toner? Are many users using remote printing services? Are these using their Internet-ready printers or online printing services? Which segments are using remote printing as a substitute for home printing, and which as an additional way to print? Are most Home printers purchased from the same types of outlets as ink/toner is? Are most Home printers purchased from the same types of outlets as Home PCs are? Current subscribers of Technology User Profile may obtain this information directly from MetaFacts, as well as additional customized drilling down into the full TUP datasets. The above questions are answered with the TUP 2014 edition, and most are also answered in earlier TUP editions for ready trend comparison. There’s a cartoon making the rounds online about a FaceTiming family. While Mom and the teens can clearly see each other’s faces, Dad doesn’t seem to get it that holding the phone to his ear isn’t the best way to communicate using FaceTime or video calling. Those of us who are facile with technology products – let’s not be hard on any new users. After all, activities like communication work best when everyone is involved. Newer technology can be daunting, even those who are well-experienced with one type of technology may be new to another. Age alone does not define who is the most experienced or tech-savvy. Presence of children is a contributing factor with technology adoption. Based on results from the most-recent wave of Technology User Profile, adults in households with children are more interested in wearable technology. Over half (52%) of adults in households with children agree or strongly agree with the statement “I would love to be the first to use wearable technology.” Adults in households without children aren’t as enthusiastic, with only one-third (33%) similarly agreeing. Making video calls with services as Microsoft Skype, Apple FaceTime, ooVoo, Tango, Google Hangouts, or the like is done more often among households with kids present. Just over one third (34%) of all Connected Adults who use their devices to communicate make video calls. Among younger (18-39) employed adults with children in their household, well over half (57%) make video calls. Among older (40+) adults who aren’t employed without children present, the number is one-sixth (16%). 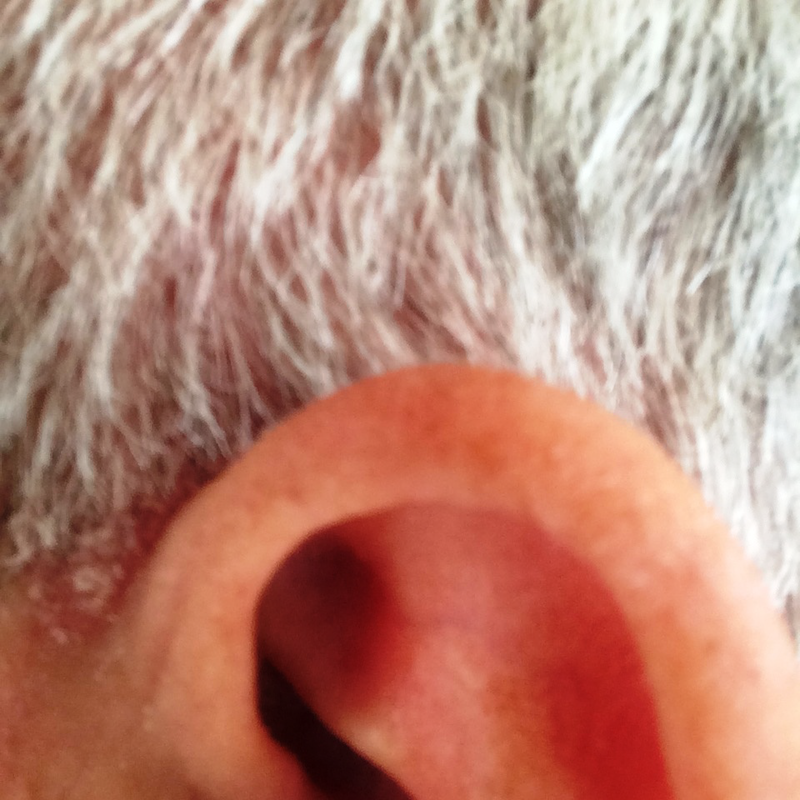 Even in one narrow type of activity – communications – there are a wealth of options. From social networking to email and voice or video calls, technology users have choices. The top-third of the most broadly communicative among us use their Connected Devices for 7 or more types of communication activities – from email to voice calls, text messaging to video calls. 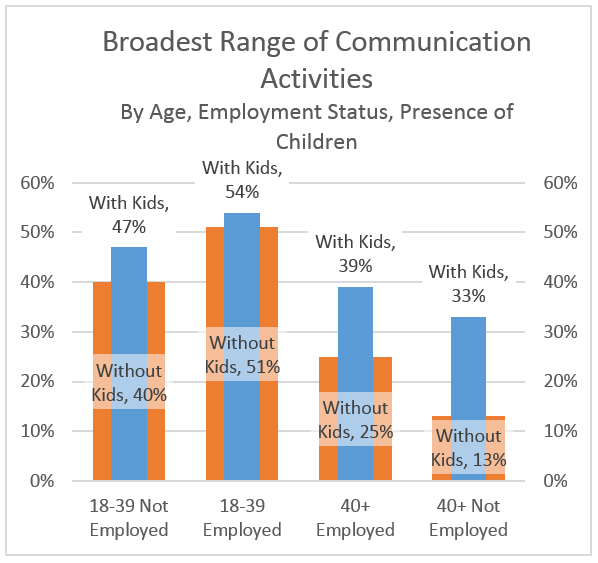 One of the biggest factors separating the most-active communicators from others is the presence of children, along with age and employment status. Among adults age 40 and up, employed and with children in the household, 39% are in this most-active communicator group. By comparison, only one-fourth (25%) of those without children in the household are as active. The difference is even more striking among the 40+ who are not employed outside the home: One-third (33%) of those with children in the household are the most-active, versus only 13% of those without children. Video calls and apps like FaceTime are just one mode of communications in active use. Not everyone uses the same mode of communication. While some of us favor email, others prefer text messaging. For adults with children in the household, several communication activities are used more often than for similar adults without children. Writing a blog or online journal is an activity for many more adults in households with children than among those without, at 24% and 14% of Connected Adults, respectively. For making video calls, the gap is slightly narrower at 9% – the difference between 47% of adults with kids and 28% of those without. 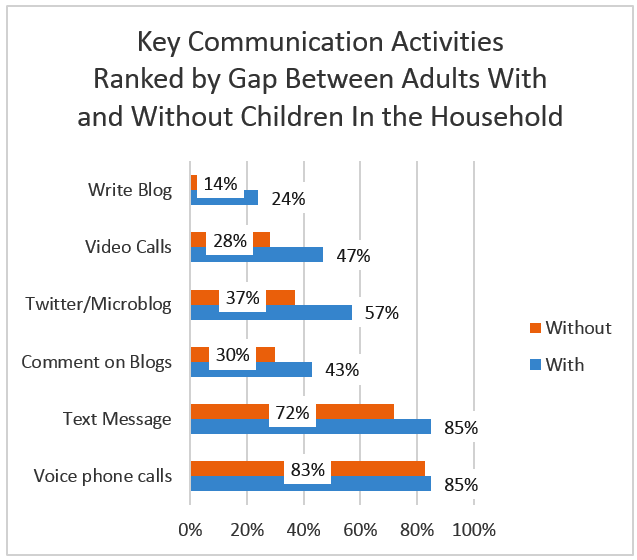 In households with any children age 5 and younger, adults use the broadest range of communication activities across their Connected Devices. 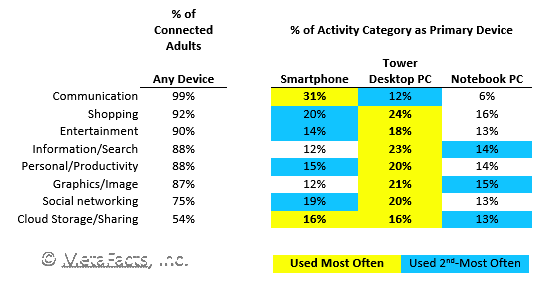 Just over half (51%) use 7 or more types of communication activities, well above the one-third of Connected Adults this usage level represents. Fortunately, over 63 million adults have children in their households. Whether or not those younger pioneers will be kind and show their elders how to use their devices to communicate remains to be seen. Whether anyone will ever develop an inter-generational translator, so that parents and teens can finally understand each other, is something perhaps too daunting for even the technology industry. These results are based on the most recent wave of Technology User Profile, the TUP 2014 edition. The large-scale survey is in its 32nd continuous year, documenting and detailing the full scope of technology adoption and use. In addition to detailing the many devices adults use to connect and sizing targeted market segments, the survey-based research details what people do with their devices. It reports which activities adults primarily use with which device. For example, TUP reports which market segments use their Smartphones or Desktops as their primary communication device, as well as which devices are primarily for entertainment, shopping, social networking, and other types of activities. Further results and datasets are available to TUP subscribers, including the full details on these technology users: which devices they intend to buy, which other devices they already actively use, the activities they’re doing and which device they do them with, their complete demographic profile, tech spending, wearable technology, and more. Technology companies who want to know more about adults with or without children, video callers users, or about their current or future customers can contact MetaFacts to learn how to subscribe to the rich resources of Technology User Profile.